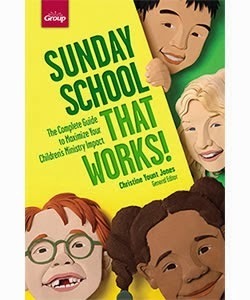 Group Publishing has just released a great new resource called "Sunday School That Works...the Complete Guide to Maximizing Your Children's Ministry." I had the privilege of writing the opening chapter and sharing how to lay a great foundation for your children's ministry. insights for every age level! I'm giving away a free copy of the book to one of our readers. You can enter by emailing dalehudsoncm2@gmail.com. The winner will be announced here next Monday. You can also order the book at this link. Current insights on today's Sunday school! Experts actively working in the field offer you the most current insights and advice for what's happening in churches--and what's relevant to kids and families today. Practical ideas that are proven to work! These fresh ideas really work--in actual Sunday school ministries. They've been tested and tweaked to guarantee success in today's churches! Insights for every level of Sunday school! Whether you're a seasoned veteran or new to Sunday school ministry, you'll refer to this resource regularly for the help you need! I'm also excited this book is out. As far as I know it is the first book ever about Sunday School that includes a chapter on the child of divorce. Thanks for promoting this book.